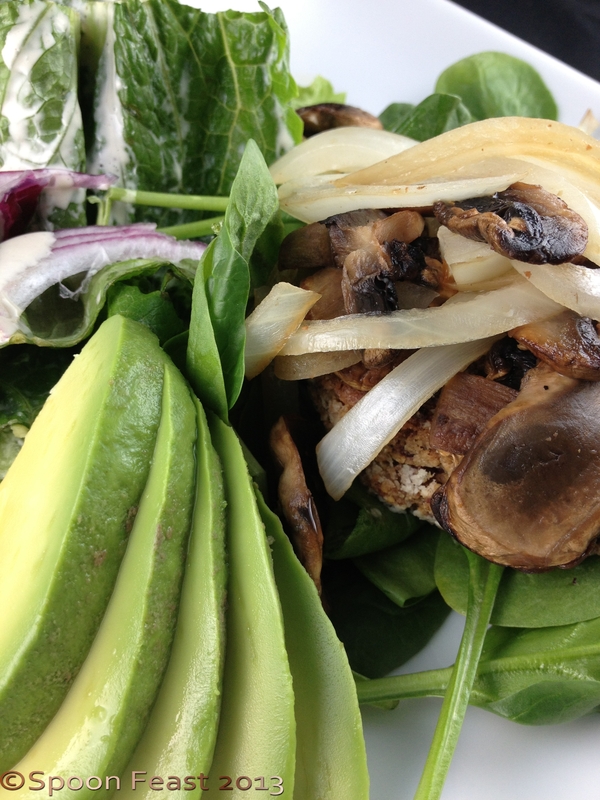 Bean Burger; Can you see it under the mushrooms and onions? I had to take the picture before Robert got to the table and didn’t have time to “present” the burger for photos. This simple and great tasting bean burger is quite simple to make and is versatile enough to become many things besides burgers. Start by cooking the oatmeal. 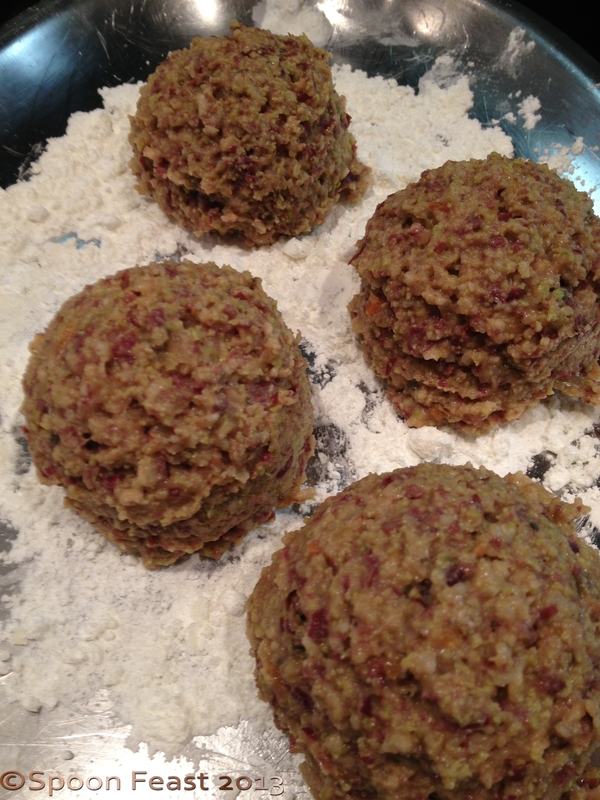 Include the garlic, onions and dried vegetable flakes if using for flavor. 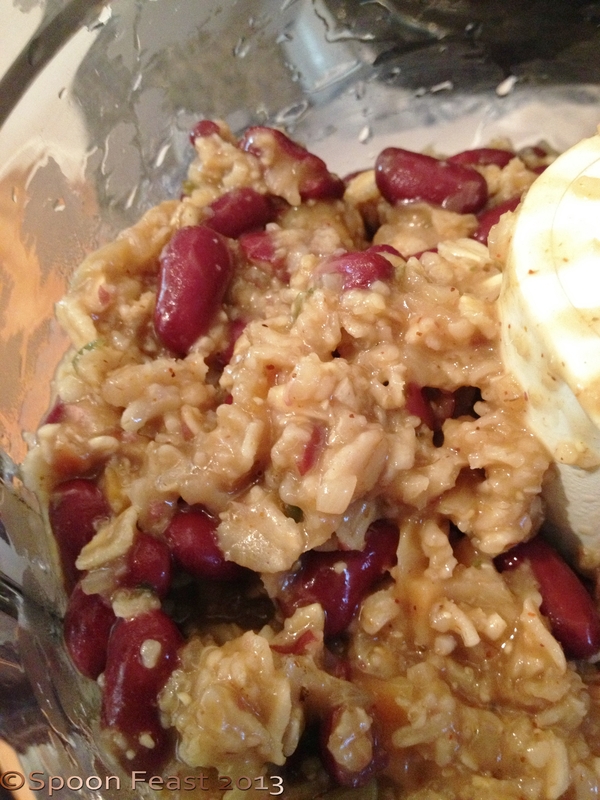 Drain the beans, rinse and add to the oatmeal. 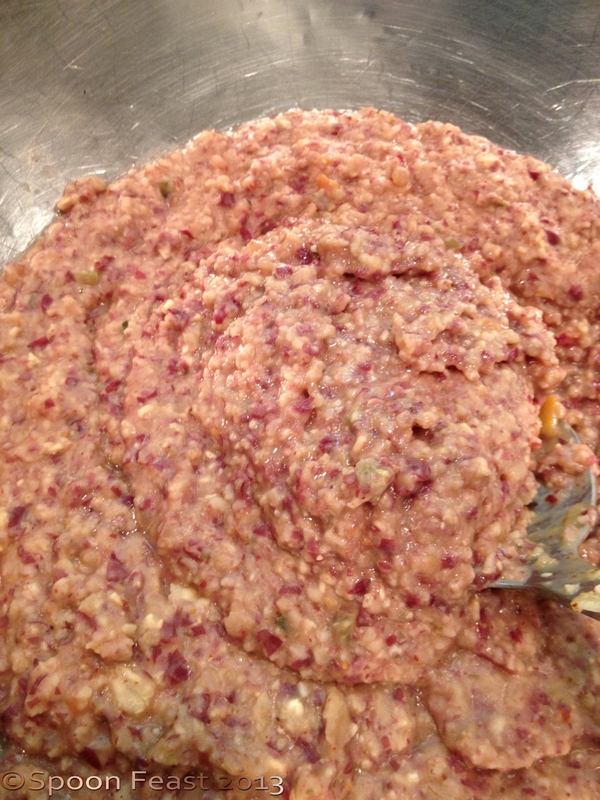 Process the mixture in a food processor until things are coarsely chopped up. You do not want to make a paste. Form burgers using a scoop for even sizes. 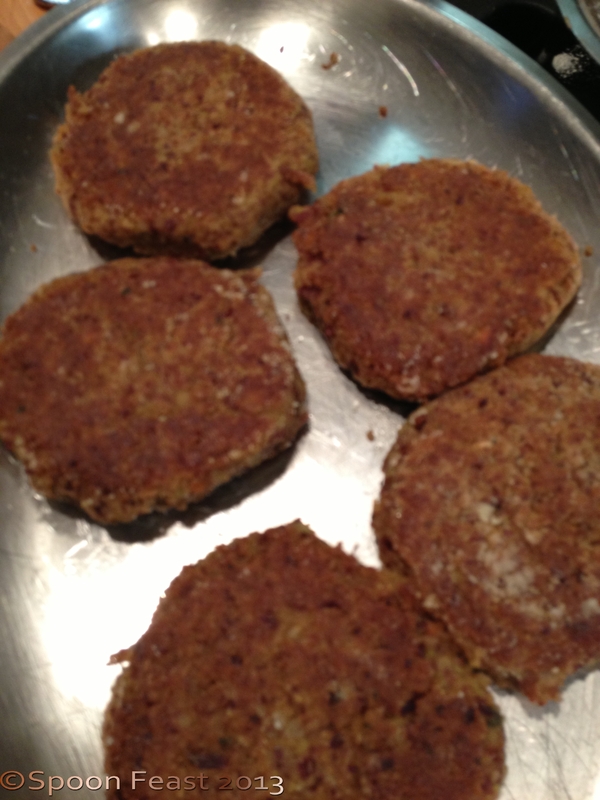 Pat the burgers with additional pistachio or almond meal to ‘dry’ the outside of the burger. This will allow it to become nice and golden brown. Using a very small amount of coconut oil or olive oil in the bottom of a saute pan (or use a non-stick pat and go fat-free) place the bean burgers into the hot pan, being careful not to overcrowd the pan. Saute them until golden brown on one side, flip and cook on the other side until golden brown too. You can finish cooking them in the oven or hold them in the oven until you are ready to eat. Remove the burgers from the saute pan and then add sliced mushrooms and sliced onions, saute for 2 minutes, then add 1-2 tablespoons of water, continue cooking until the water is evaporated. 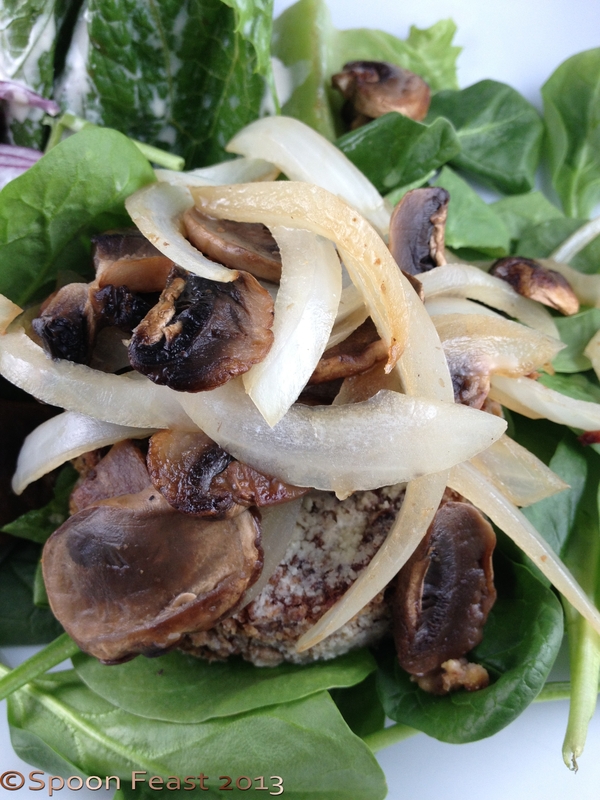 Serve the sautéed onions and mushrooms over the bean burgers. This evening, we served them on a bed of fresh spinach with a side Caesar salad. I couldn’t eat it all! If you have leftovers, you can saute the crumbled burgers with some diced onions, chili powder, cumin and diced tomatoes to make “taco meat”. Fill corn tortillas and finish with your favorite taco toppings. I find this can be used nearly the same as you would ground meat. Make chili, tacos, casseroles etc. This entry was posted in Cooking, Recipes, To Tyler: How to Cook:, What every good cook should know and tagged Bean, bean burgers, Chili powder, cook, Fruit and Vegetable, Garlic, Home, oatmeal, Olive oil, Onion, vegetarian, veggie burgers. Bookmark the permalink. The bean burgers and salad sound like a tasty and filling meal.